Dry. Prairies, open woods, fields, roadsides. This is an understory plant in tallgrass prairies. This is a 2″ to 12″ tall, erect, ascending, or sprawling, perennial forb that rises from a rhizome. It often forms loose colonies. 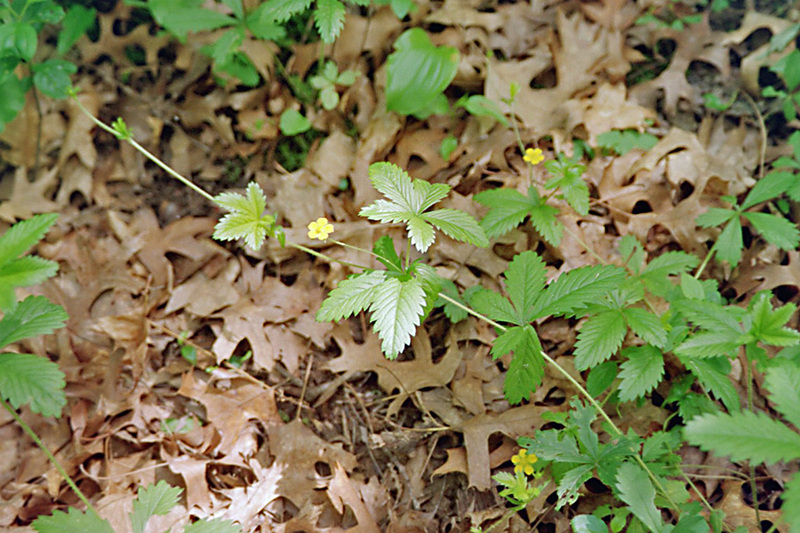 The plant is erect at first, reaching up to 12″ at first flowering. Later, the stems lean becoming widely ascending. Still later, they arch to the ground and sprawl along the ground with the tip ascending. These runners extend 6″ to 20″, have long spaces between the nodes, and root at the nodes. Eventually, they root at the tip, and produce a terminal tuber. 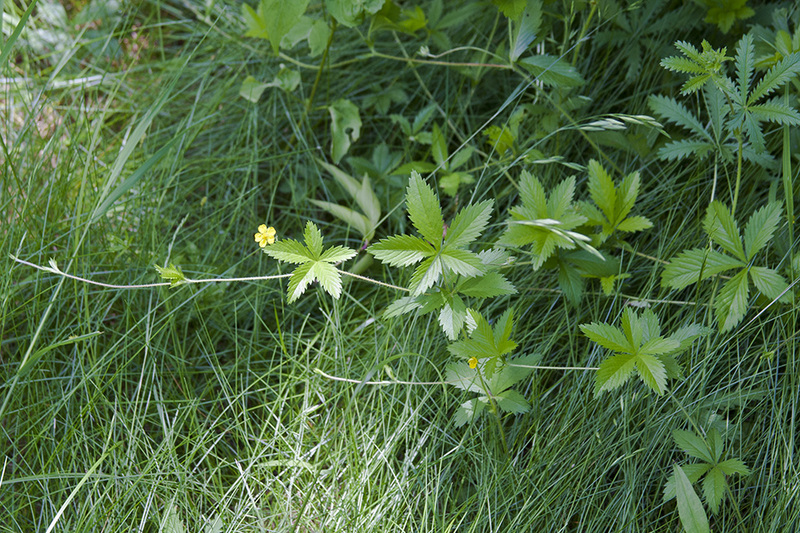 The stems are thin, and covered with long, soft, shaggy but unmatted hairs. They are initially green becoming reddish with age. 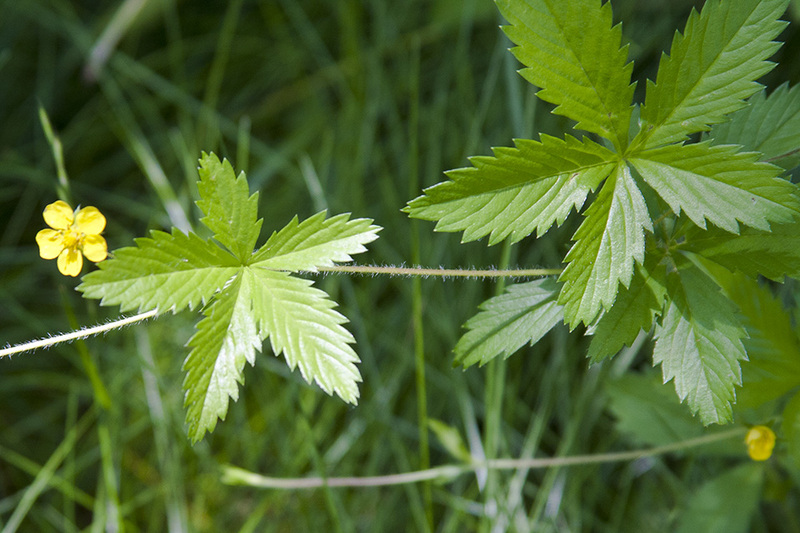 The leaves are alternate and palmately divided into 5 leaflets. The leaflets are inversely egg-shaped to elliptic, ¾″ to 2¾″ long, and up to ¾″ wide. Young leaflets are narrow with margins curled up. 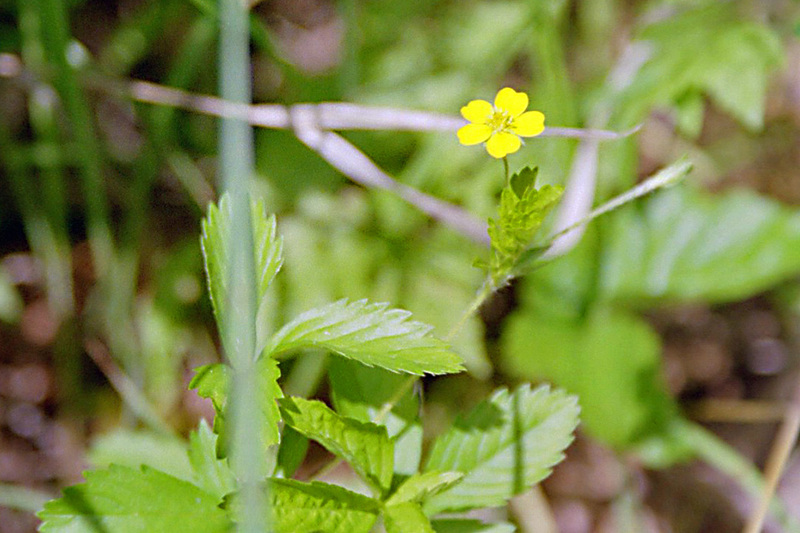 The margins are coarsely toothed except near the base, where the leaflet attaches to the stem. The upper surface is hairless and conspicuously veined. The lower surface is hairy or nearly hairless. The inflorescence is a single flower rising on a long, thin, hairy stalk from some of the upper leaf axils. The lowest flower usually arises from axil of the second well-developed leaf. 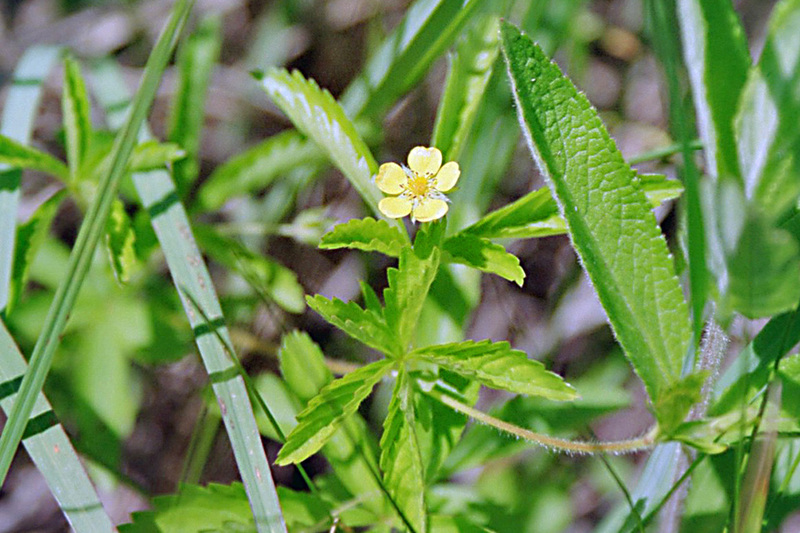 The flowers are 2 ⁄5″ to 3 ⁄5″ wide.The 5 petals are yellow, broad, narrow at the base, rounded at the tip, and sometimes slightly notched at the tip.The 5 green sepals are a little shorter than the petals and alternate with the petals. 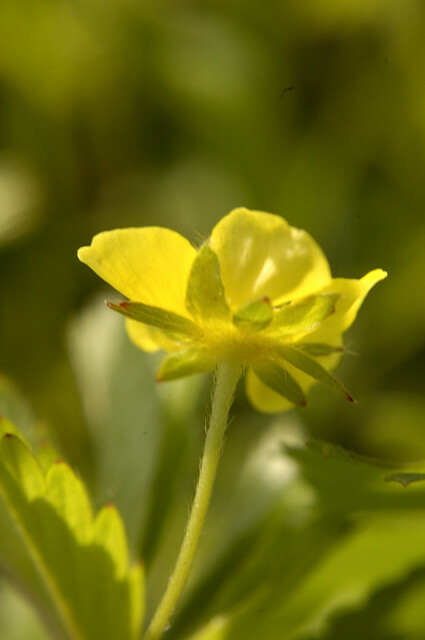 The 5 bractlets are smaller than the sepals, alternate with the sepals, and are hidden below the petals when the flower is viewed from above. There are 20 yellow stamens. There is no floral scent. 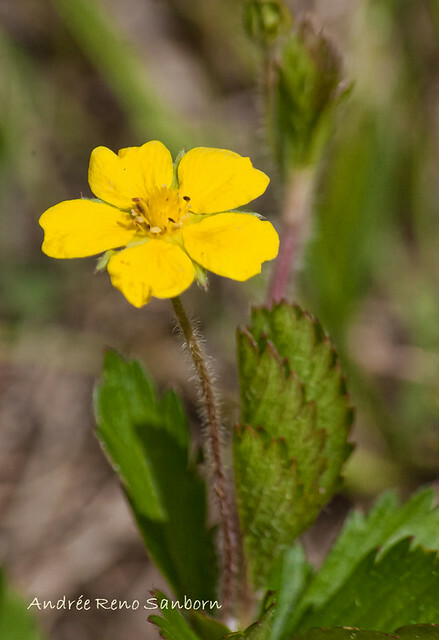 Dwarf cinquefoil (Potentilla canadensis) is similar in appearance, but does not occur in Minnesota. Distribution Sources: 2, 3, 4, 5, 7, 28, 30. The upper angle where the leaf stalk meets the stem. A small, often secondary bract within an inflorescence; a bract that is borne on a petiole instead of subtending it. Similar to a hand. Having more than three lobes that radiate from a single point at the base of the leaf.